Harley-Davidson's Sportster family of motorcycles needs no introduction. The American cruiser maker is known for its large, chrome-laden cruisers primarily, but its Sportster family consisting of smaller motorcycles (with lesser chrome!) enjoys far more popularity globally. The Sportsters are the stepping stone into Harley's dazzling world of chrome and camaraderie and find favour with younger riders across the world. 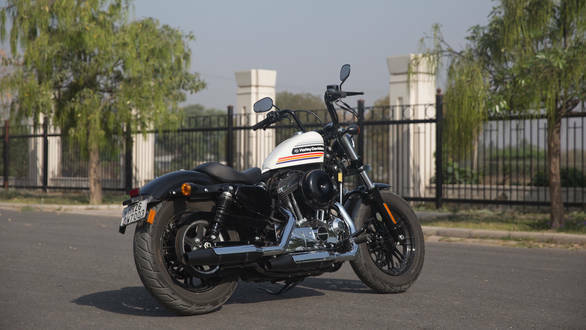 And as part of its plan to launch a 100 new motorcycles by 2027 H-D has expanded the Sportster family, adding the Iron 1200 and the Forty-Eight Special. We rode both bikes in Europe briefly last year but the Forty-Eight Special is now on sale in the country, so it's time to tell you how the bike fares on our roads. Not much has changed visually, in the sense that the Special wears the same 'Bobber' look as the standard Forty-Eight and has a retro-cool appeal and also gets an attractive looking 70's paint scheme on the tank. The big change on the visual front is the new mini-ape handlebar though. The standard Forty-Eight's short handlebar looks cool, especially with the underslung rear-view mirrors, but it isn't very comfortable. The mini-ape looks cooler and also makes the bike more comfortable. More on the comfort later though. The handlebar makes the Special look different and it's interesting to note the difference a handlebar can make to a motorcycle's appearance! The bare-minimum rear end  sans even a pillion seat  is the same as the standard Forty-Eight and the stop lights integrated into turn indicators have look nice even today. The bike runs on 16 inch wheels shod with fat tyres (130/90 upfront and 150/80 at the rear) which add to its distinctive looks. The minimalistic approach works well and despite the fact that Harley-Davidsons are a common sight now, the Forty-Eight Special did command second glances on the road, especially with its tall handlebars and fat tyres. I would have liked a newer or more detailed instrument cluster though. The single pod unit is the same one we've been seeing for a long time now and more information or a different design would be welcome. The Forty-Eight Special is powered by the same 1200cc, Evolution V-twin motor as the standard, mated to the same five-speed gearbox. The engine offers 97Nm from just 3,500rpm, so there's lots of thrust right from the word go. In fact, lack of any electronics (except ABS) means the bike is willing to spin its rear wheel rather quickly when taking off from standstill. 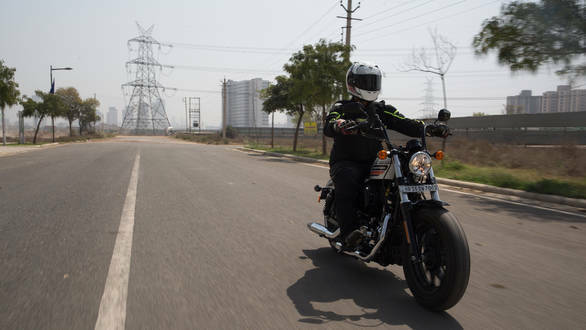 Engine performance keeps you enthused while the gearbox offers precise shifts, albeit with a massive clunk, in typical Harley-Davidson fashion. Clutch action at the lever is heavy though and as I discovered riding in Gurugram's traffic, the Forty-Eight Special can leave you with slightly sore fingers. Another discovery in the traffic was engine heat. Being a 1.2-litre air-cooled engine the motor tends to heat up in traffic and temperatures of around 40 degree Celsius certainly didn't help. I was impressed with the gear ratios, especially in traffic. The strong bottom end ensures gear changes are minimal and there were a lot of times when I thought I was in third gear given the strong pull though I was in fourth! What's even more impressive is how light and maneuverable the bike feels despite its 252kg kerb weight. I was also expecting the taller handlebars to restrict me from making quick directional changes but the Special feels quick to steer. In fact, the mini-ape handlebars have another advantage. 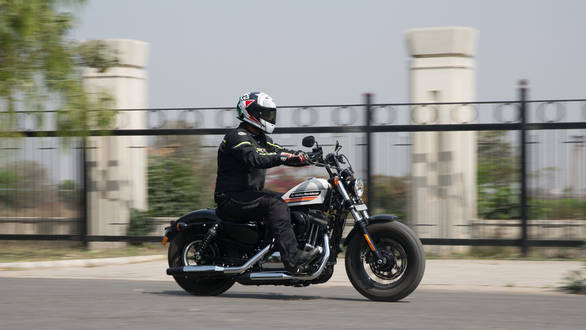 The standard Forty-Eight's short handlebar requires you to crouch forward to reach it, which coupled with the lack of a pillion seat has you slide back when accelerating hard and you are pushed almost off the seat. Since the mini-ape has you sit upright this issue is taken care of, though it has more advantages on open roads. And out of city confines is when the Forty-Eight Special came into an element of its own too. Short-shifting through the gearbox I was cruising comfortably at 120kmph in fifth, with the digital tachometer on the tiny digital display reading around 3,500rpm. This is impressive as the bike feels smooth, sans vibration, despite the fact that the Forty-Eight's chassis and powerplant are a lot older than say, the Street 750's. Overtaking most vehicles is easy, as rolling on more throttle does the job. This nature of the engine coupled with the comfortable seating position makes long rides comfortable. 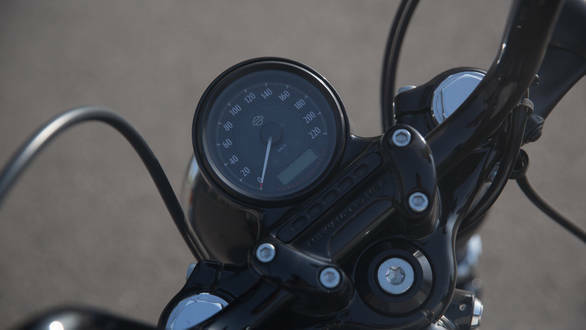 That said, fuel tank capacity is just 7.9 litres which means the bike will call for fuel stops rather quickly. Dynamics are likeable too. The Forty-Eight Special allows you to push around corners till you ground the footpegs and while the sounds aren't too pleasing, the bike feels confident, and handling is impressive despite the limited ground clearance. Brakes work well too  the single disc upfront offers ample retardation in a safe, reassuring manner. Even more impressive is the ride quality. I've usually found Harleys to transfer shocks to the rider when going fast over potholes and bumps, but the Forty-Eight Special surprised me. The 49mm cartridge-type forks offer good damping and soak up bumps well in conjunction with the high-profile tyres. That said, in a bid to keep the saddle height low Harley has made the seat quite thin and while it is comfortable, the seat does transfer some of the shocks to the rider. Overall ride quality is impressive though, even better some of the other bikes in the family. more special. It has a more distinctive appearance and if you're looking for some attention on the road, the Special will do it better. It's got the performance and handling to keep you enthused and is comfortable enough to go for that long weekend ride too, though you will end up stopping a lot for refueling and the bike has no fuel gauge either. Harley-Davidson's virtually endless customisation catalogue means you can add that pillion seat for the girlfriend as well and also change pretty much everything on the bike. The Forty-Eight has always had a charm of its own and in my books the Special has one too. 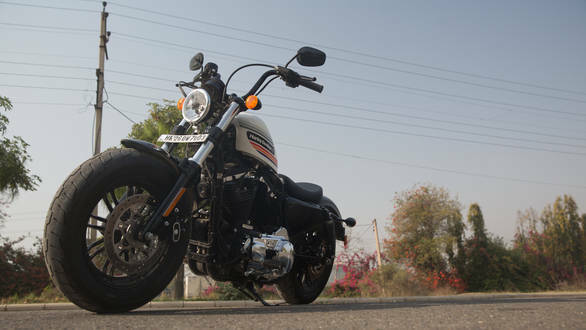 Like several other Harleys it is assembled right here in India and is priced at Rs 10.98 lakh ex-showroom which is a good price for a well-built, 1200cc cruiser. 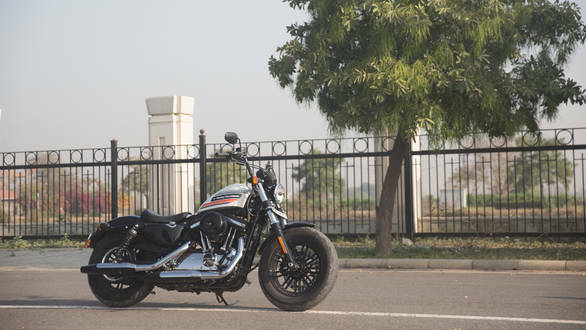 But more importantly the Forty-Eight Special is not too large or too heavy, making it a great choice in the Sportster family irrespective of whether you choose to commute on it daily or go out on long rides.